Jake Needham may have made this stuff up, as he says, but it is his attention to detail that makes his writing so believable. Inspector Tay was not found sitting at a coffee table, but “in front of him were a small box of aspirin, an espresso cup, two packs of Marlboro Reds, a purple plastic disposable lighter and an ashtray.” Immediately you have a snapshot of the man, who is taking on an identity as you read further. Needham is a wordsmith. Sam Tay might appear as somewhat of a reticent plodder, but he is a man determined to get to the bottom of the mystery (as does the reader, by this stage). 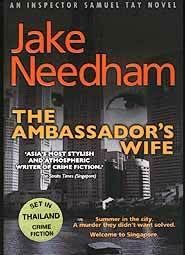 The story unfolds in Singapore, with the first corpse revealed as being the American Ambassador’s wife. When the American Embassy, and the CIA become involved and begin pushing the investigation in one direction, Inspector Tay becomes even more obstinate in his handling of the case. One can easily sense the animosity. Then, if that is not enough to jangle some wires in the CIA, the next corpse, which is discovered in Bangkok, turns out to be the American Ambassador herself. The action shifts to Pattaya, and those who are conversant with this tourist resort will see many familiar landmarks, including the Marriott Resort and Shenanigans. There is also a wonderful pen-sketch of those who are found nursing bottles of beer while sitting at the ubiquitous beer bars, being waited upon by young women. Returning to Bangkok, there is much interaction between the various branches of the American law enforcement agencies, known by an alphabet soup of acronyms, some Thai police and our lonely Singaporean inspector. More twists and turns come thick and fast as the action speeds up towards the final few chapters. Murders, unexpected murders, the bad guys go down but weren’t bad guys after all, the good guys go down, but they weren’t good guys after all. And all through revelation after revelation and inspired guesswork walks Inspector Samuel Tay, the little Singaporean law enforcement officer who was there right to the surprise ending. Plus an American by the name of John August, who works for you know who! The review copy was made available by Bookazine and has an RRP of B. 495. A classic ‘who-dunnit’ which will keep you turning pages, thirsting for the next batch of information, and also keeps you guessing to the end. A great read. Quite what Angel Air are trying to achieve with this rather shoddy collection I am not sure. Amongst the thirty two tracks up for your appraisal are eight tracks from Mott the Hoople themselves. Two of which are previously unreleased and have laid in the vaults of Island Records since 1969 and 1970 respectively. The reason they were not released at the time is because they were not considered to be good enough then to put out to the record buying public. Well let me assure you that nothing has changed in the ensuing years to change the value of these recordings: ‘Can You Sing The Song That I Sing’ is appalling, ‘The Chosen Road’ is worse. Then we have two songs from Mott The Hoople’s concert at the Tower Theatre, Philadelphia in 1972. These are recorded from a hand held microphone in the audience and are therefore of low quality. The fact that it is supposed to be a historic gig due to the fact that David Bowie, then at the height of his Ziggy Stardust era fame, joins the band on stage for a rendition of ‘All The Young Dudes’ makes no difference to your listening enjoyment at all. In fact “All The Young Dudes’, probably Mott The Hoople’s best known song (although a long way from being their best song), is so badly taped as to be almost unrecognizable. Two other live recordings are delivered up from Mott The Hoople’s tour of the United States of America at the Santa Monica Auditorium in 1974, and the band are firing on all six, but lead vocalist Ian Hunter is suffering from laryngitis. 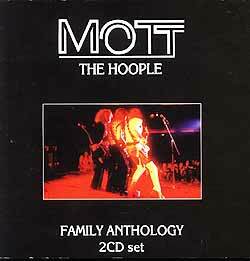 A prior arrangement had been made to record this show for American radio but perhaps not a good idea to put it out as something for the public to judge Mott The Hoople as a live band, especially if Angel Air want to sell any more of their Mott The Hoople back catalogue. The two gleaming exceptions to this are the two songs recorded in Stockholm in 1971 for a BBC Radio One in concert. The heart rendering version of Mott The Hoople’s cover of Sonny Bono’s ‘Laugh at Me’ is caught in all its glory, and wisely the record company have decided to open proceeding’s with ‘Walkin’ With A Mountain’. This is nearly seven minutes of Mott the Hoople at their most outrageous rock ‘n’ roll best, starting out with some great Chuck Berry riffs at breakneck speed, and just getting faster, until Ian Hunter brings the band back down to earth with a ripping journey through Stones land with verses of ‘Satisfaction’ and ‘Jumpin’ Jack Flash’ done Mott style, before the band roar back in with Mick Ralph’s ripping solos out of his axe that make the air bleed. Rock ‘n’ roll at its very best. But from the Mott the Hoople quota, two out of eight is not good enough. Out of the other twenty four tracks supposedly from the Mott The Hoople family, there are not many pearls among the swine. The one absolute gem is a new version of the Mott The Hoople classic ‘Roll Away The Stone’ by the Ariel Bender Band, recorded specially for this collection, although if they had heard the rest first they might not have bothered. Mott’s original version of this was amazing, but this just wipes the floor with it. Ariel Bender’s guitar has been pushed all the way to the front, grabbing you by the throat and not letting go. Vocalist Marc Eden snarls the lyrics at you like they were supposed to be in the first place, whilst the rest of the band rip into the song with glee. The Ariel Bender Band will be releasing their debut album in the very near future and this version of ‘Roll Away The Stone’ will be on it. So If I was you I would wait for that. I will keep you posted through Mott The Dog. There is also a very good cover of the Freddie King instrumental ‘Hideaway’ by Bad Company featuring Mick Ralphs. This is very good, but there is a much better version of this song with Mick Ralphs from when he toured with the Ian Hunter Band in 2003 on the bootleg album ‘A Night At The Opera’. The final positive thing about this collection is that either CD finishes with a track from the only album ever released under the joint Hunter: Ronson banner ‘YUIORTA’ (Say each letter out loud and you will get the joke on an old Three Stooges joke). If the album gets people to go out and buy this wonderful album then at least something good will come of it. So of the twelve tracks mentioned, we have six that are worthy of your attention. Let me assure you there is nothing else here that does not make you want to reach over to push the fast forward button. Most of it is laughable. This Family Anthology with one or two exceptions should be avoided at all costs.